Sip cappuccino on the piazza under the Duomo's facade. Watch the last paper-maker at work in his shop. Learn about Amlafi history in the Arsenale museum. What do coffee, St. Andrew the Apostle, papermaking, compasses, and the Knights of Malta all have in common? The answer: Amalfi, a tiny coastal town that, believe it or not, was once Western Europe's gateway to the wider world. The North African–style casbah of whitewashed back streetsof the once-great maritime port of Amalfi are full of history, recalling a time in the Middle Ages when it rivaled Genoa, Pisa, and Venice as a trading behemoth—which is why it has such an impressive cathedral, and a museum celebrating the fact that it wrote the world's first marritime code (er, and the tradition—untrue—that Amalfi invented the compass). Most modern visitors look at this little fishing town by the sea, an oversized village of a mere 6,000 souls, and wonder how it ever could have laid claim to such medeival fame. The modern version of Amalfi, however, does enjoy the best variety of lodgings, restaurants, and sights and activities of any along the Amalfi Coast. 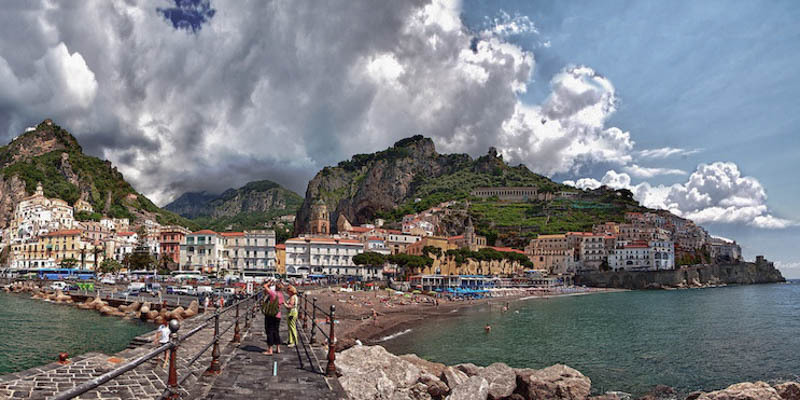 Add to that this is it the most central town along the coast—and the transfer station for all buses—and Amalfi makes for a perfect base to explore the area. How long does Amalfi take? Planning your time: You could see every official "sight" in the town of Amalfi in 60–90 minutes—though it is a lovely place to relax for a while, maybe take a cappuccino on the piazza overlooking the steps up to the Duomo. Amalfi also makes an ideal place to spend the night. It has several good restaurants, and the town is just large enough to keep the feeling that there's a bit of local life beyond the tourism, making it a joy to wander (the others—Positano and Ravello especially, may be more postcard-quaint and pretty, but Amalfi feels more real). Besides, it is the one place on the Amalfi Coast where you have to switch buses—either to return west up the coast toward Postiano and Sorrento, to made a side trip up to pretty Ravello, or to continue east along the coast to Salerno. Amalfi town is the turnstile for coastal public transportation. If you're traveling the Amalfi Coast by bus, you always have to get off in Amalfi at the main harborfront Piazza F. Gioia and switch to another bus to continue on, as this is the central terminus for buses from Sorrento and Positano to the west/north, Ravello up in the hills, and Vietri and Salerno to the east/south. If you're driving, there's public parking lot by the port.